At Eastside Animal Medical Center, we understand that feline cancer is a devastating diagnosis. It is natural to feel highly emotional. However, a cat cancer diagnosis is not necessarily a hopeless one. Depending upon how early it is identified and the type of cancer involved, there are certainly options that can lead to very positive outcomes. Our veterinarians and support staff are well trained, highly empathetic, and understanding of the fact that it is necessary to focus on both the emotional and medical aspects of treating cats with cancer. We are here to work with you to make sure you have a good understanding of your cat's illness and to help you make decisions that will be best for you and your cat. 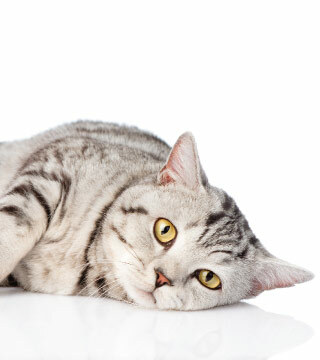 How Common Is Cancer In Cats? Similar to human beings, cancer in cats is a leading cause of death among older felines. Although the specific causes of cancer in cats is currently unknown, many experts consider the feline leukemia virus to be a contributor. Other factors that might increase cat cancer include toxins from the environment or second hand smoke. It is important for you to understand that depending on the specific circumstances of your cat's condition, feline cancer may be treatable. Medical advancements have provided us with more treatment options for cats with cancer. However, the best way to prevent cancer in cats is to emphasize a healthy lifestyle and adhere to a preventive health care regimen. This includes scheduling regular wellness checkups with your veterinarian. Should you spot any symptoms, we urge you to schedule an appointment with your veterinarian immediately. Only then can they perform the necessary diagnostic tests to determine whether or not cancer is present, and to what extent. Cat cancer can be aggressive, and requires immediate intervention. If cancer is diagnosed early, the prognosis for recovery increases significantly. There are various types of feline cancer. We have compiled a short list here, meant only to serve as an introduction to some of the more common types of feline cancer. If you suspect your cat may have cancer, please schedule an appointment with one of our veterinarians. Ceruminous Adenomas These small tumors are dark blue, brown or black and are usually confined to the external ear canal. Lymphoma- lymphosarcoma (LSA) is common among cats with feline leukemia virus infections. It affects the intestines and other lymphatic tissues in the abdominal area. Symptoms include loss of appetite, weight loss, vomiting, diarrhea, bloody stool, and constipation. LSA can only be formally diagnosed through medical procedures your veterinarian can administer. Myeloproliferative tumors are genetic, and can be passed on through reproduction. It affects bone marrow and blood. Symptoms include weakness, labored breathing, pale mucus membranes and a loss of appetite. Melanoma tumors are basal cell tumors. They are not very common in cats, but can occur nonetheless. They usually are found around the neck, head, ears and shoulders in cats. They are mostly benign, and form as solid lumps underneath the skin. Squamous cell carcinomas affect areas lacking natural pigmentation, such as the oral cavity, tonsils, lips, nose, eyelids, external ear, limbs, toes and nails. They can also occur in areas under constant irritation or trauma. Diagnosis takes place by performing biopsies. Mast cell tumors appear as skin nodules that are ulcerated or pigmented. They can be located anywhere on a cat's body, and must be biopsied to diagnose. Osteosarcoma tumors affect the bones, joints and lungs. These tumors can lead to swelling, lameness, coughing, and breathing difficulties. Diagnostic tools include X-Rays and biopsies. Fibrosarcoma tumors occur in the fibrous tissue just beneath a cat's skin. They can appear as solid, irregular masses underneath the skin. A biopsy is the most accurate diagnostic tool. Lumps underneath the skin do not always indicate cancerous tumors in cats. It is also possible to find what seems like the symptoms described above without the presence of cancer. Therefore, if your cat is exhibiting any of these symptoms, we recommend making a veterinary appointment immediately, and avoiding the urge to make your own diagnosis. Only your veterinarian can accurately diagnose cat cancer, or another potentially dangerous illness or condition that might be developing in your feline friend. The first key to cancer treatment for cats is proper diagnosis. At Eastside Animal Medical Center, we begin with a full physical exam. We commonly look at blood work and when necessary employ the use of diagnostic imaging such as radiography or ultrasound. We will also perform needle aspirates, which is a form of biopsy where a needle is inserted into the tumor to collect cells for use in determining tumor type. This is a non-painful and minimally invasive method used for diagnosis. Some tumor types require a core biopsy for diagnosis. In certain cases, cancer specialists may be employed for further diagnostic testing (such as MRI and CT scans) and to be part of our team in treating your cat's cancer. Communication with you is important throughout the process of diagnosis and treatment. This includes discussing all possible cancer treatment options for your cat, and the various possible outcomes. Our number one concern is the best interest of your cat. We also evaluate the costs involved, your expectations, possible lifestyle changes, and any possible side effects of treatment to ensure that you are able to make informed decisions. Complementary treatments may include acupuncture, immunotherapy, or nutritional therapy. Fortunately, for all the unknowns where cat cancer is concerned, we do know more about cancer in cats now than we ever have before and because of this, you now have more options than ever when pursuing cat cancer treatment. If you suspect cat cancer, whether finding a lump or noticing behavioral changes, please contact us immediately to schedule an appointment. Our veterinarians and veterinary support staff will provide you and your feline friend with compassionate, comprehensive care and support services. Although cat cancer can be frightening and painful, we are here to help ease your cat's pain and suffering and eliminate the cancer through the best veterinary care available.